…and Venice was one of the most important cities for trade during the Renaissance. That’s where Old Kings comes in. The “Old Kings” townhouse at Franziskanergasse was built around 1500. Initially it served as a medieval warehouse for the famous Fugger merchants. 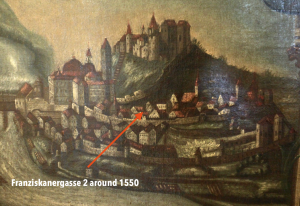 During the Renaissance, the Fuggers were Germany’s richest merchant family, trading along the Via Claudia Augusta that led from Italy via Füssen and Augsburg to the Danube River. Dominating the trade across the Alps, the Fuggers owned a wide network of businesses and warehouses. A network of horse couriers connected these businesses and warehouses—and the couriers were the first to rest overnight in this house. Franziskanergasse 2 became a townhouse and workshop for a local brushmaker after World War I. 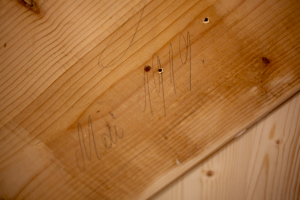 Check out the carpenter’s dating (1919) on our staircase. In the 1970s it became a bed and breakfast. The house underwent a major renovation in 2012/2013 and 2016 and reopened May 1, 2016. The Oscar-nominated Hollywood classic “The Great Escape” starring Steve McQueen and Richard Attenborough, was filmed around Franziskanergasse 2. Key scenes are shot steps away from our entrance and in the back of the building. The film about British prisoners of war escaping a Nazi camp was one of the highest grossing films in 1963.